Okay y’all…I’m totally obsessing over apple cider vinegar and all it’s benefits! My great grandma used to drink a mixture of water, apple cider vinegar and honey. My grandpa has followed in her footsteps and drinks it everyday. He likes the taste, but he also likes the way it makes him feel. Once in a while when I went to their house, I would have a glass or two. But recently I had it at their house and realized – WOW this is delicious…and healthy?! You can’t go wrong. 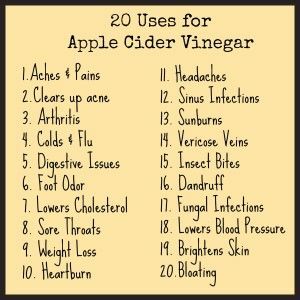 Apple cider vinegar has so many benefits!